Golf Cart or UTV: Which Utility Vehicle is Right For You? | Intimidator Inc. The neighbor down the street just purchased a brand new side-by-side. It has all the bells and whistles and just looks like a lot of fun. You have other friends who have golf carts and swear that they can do anything that the other guy can do with his new UTV. After a little research, you are still confused. Do you need a golf cart or a UTV? Check out the comparison below and make the decision for yourself. One of the biggest reasons for purchasing a golf cart or a utility vehicle is so that you have help to “cart” things around. However, there is a big difference when it comes to hauling and towing. Golf carts are usually built for one thing...golf. Their only job is to haul a passenger or two and their golf equipment from one tee to the next. Most people who work on farms, have a large facility to operate, or manage a large amount of acreage often need more than your standard golf cart. 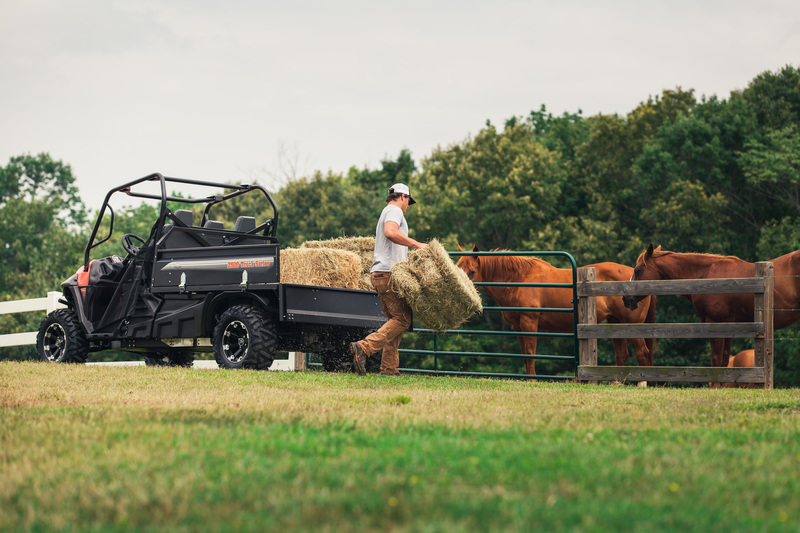 They need a powerful utility vehicle that can haul and tow heavy loads such as bales of hay, bags of feed, and equipment. The Intimidator Truck Series can handle 1,200 lb and has a towing capacity of 2,100 lb. Most standard golf carts have a weight limit of under 1,000 lb. The Intimidator Truck also has a full-size truck bed that can easily convert to a flatbed to accommodate different sized loads. Yes, it is true that most gas powered side-by-side vehicles and gas-powered golf carts do make some noise. However, both types of vehicles are also available in electric models. The Intimidator Classic Series with a 48-volt brushless electric engine is quiet, and it can get up to 23 mph depending on the terrain. It also has a 700 lb cargo bed capacity and a 1,500 lb towing capacity. While there are some golf carts that may be able to go faster, most of these carts have been modified by the owner or by a third-party company. After a certain speed, golf carts are no longer golf carts. They are known as a Low Speed Vehicle (LSV). HOW DO YOU USE YOUR UTV OR GOLF CART? When deciding on whether to test drive a golf cart or a UTV, it really comes down to how you plan on using it. Do you want a vehicle to go check the mail or will you be towing it along for weekend hunting trips? Do you plan on riding back wood trails or do you simply want to use it to travel on paved campground roads? The answer to these questions can really help narrow your search. If you have been to a campground within the last five years, then you have probably noticed that almost everyone has a cart or utility vehicle. You have probably also noticed that there are a lot of rules surrounding what you can and cannot drive on the campground roads. Most gas powered golf carts and UTVs are banned from campsites due to the noise. If this is the issue at your favorite camping spot, then take a look at our electric Intimidator Classic Series before settling on a golf cart. Trails can be tough. There are large roots, rocks, streams, and more. Going over and through these obstacles is what makes cruising through trails so much fun. While there are golf carts that can take on a trail, side-by-sides will make it so much more fun. Not only are they faster and stealthier, but because many models, like Intimidators, are designed for trail riding, they are also designed to be safer. Intimidator UTVs provide 3-point DOT Approved Restraint Belts as well as other safety features to keep you safe on the trails. It’s also easy to add accessories such as windshields, rear-view mirrors, and even full cab enclosures to protect you and other riders. If you operate a farm, then you know that you will need to haul or tow heavy equipment, tools, supplies, and food on a routine basis. While some golf carts are great for getting from one point to the other on a large piece of land, they don’t exactly hold up to large, heavy loads. Do you have or operate a large indoor facility or warehouse? Whether you need to get from point A to point B quickly or your legs just can’t handle another day of walking over 20,000 steps, you probably need a utility vehicle to help you out. Most people quickly think golf carts are the answer to increasing mobility and productivity indoors. While electric golf carts are useful in some ways, you can get even more done with an electric utility vehicle like the Intimidator Classic Series with a 48-volt brushless electric engine. 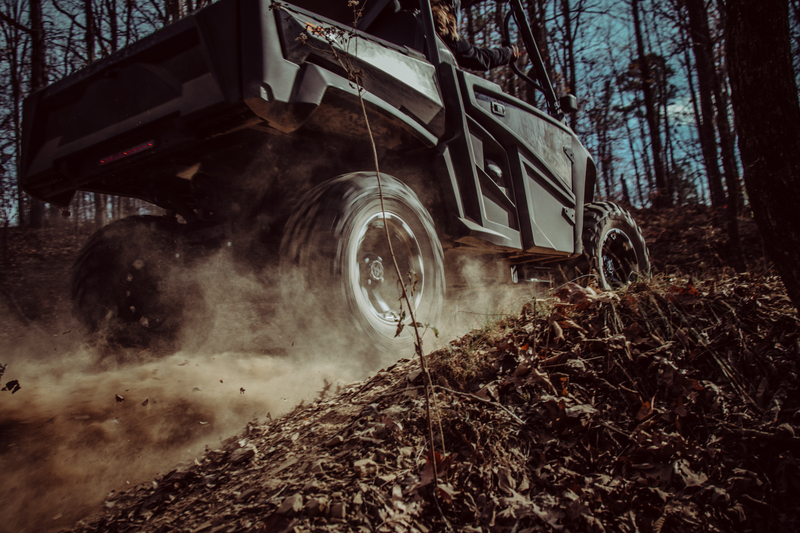 By choosing a stealthier built machine, you can still get where you need to go while also packing your tools, heavy equipment, and even more people. There are a lot of options on the market when it comes to a utility vehicle. It can be a major investment for many. While golf carts are great for those who play golf or just need a ride to take them down a perfectly paved road, Intimidator UTVs were built to do so much more. 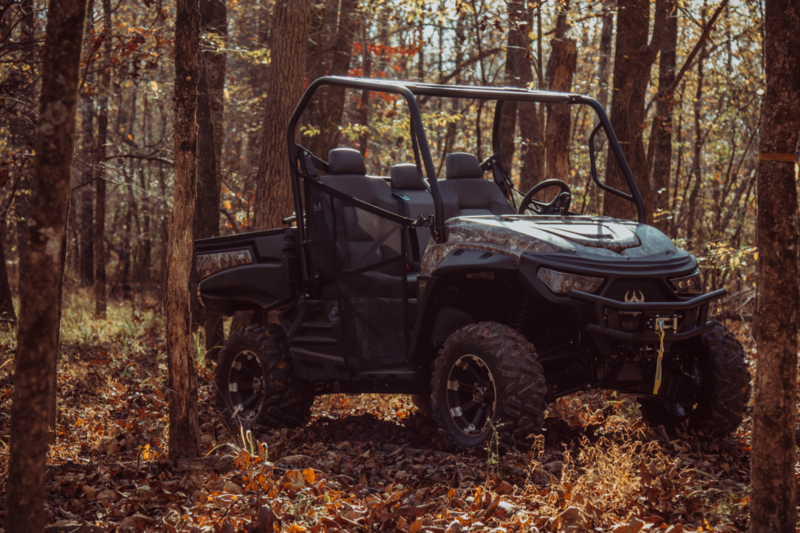 To learn more about these side-by-side UTVs, browse through our website and check out the different models and engines, watch the videos, and find us on Facebook. However, if seeing is believing, then use our DEALER LOCATOR to find an Intimidator UTV dealer near you.